We have the right presentation folder for you! 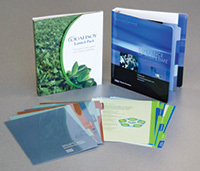 We have many styles of presentation folders for you to find the correct one to fit your application! Choose our most popular folder, the 9" x 12" two pocket PF-105 or any of our other basic presentation folders in our Standard Folders section. 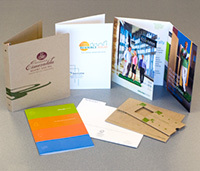 Looking for something that holds more marketing materials, consider Capacity Folders. Capacity folders have options like spines and expandable pockets that conform to the thickness of your materials. Key and Gift Card Holders are great for hotels and resorts, as well as for retail stores. 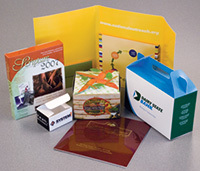 We offer numerous styles specifically designed for holding gift cards and key cards with your company's brand marketing. We also custom print specialized industry folders like Legal Folders for mortgage and title insurance companies, as well as Tax Return Folders for CPAs and accountants. Custom printing with a metallic foil stamp on a linen paper is a popular style to enhance the look of presentations. 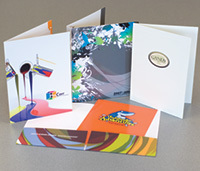 When it comes to custom printed folder products, we're your source. 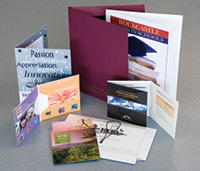 Request a quote on any folder project today!